Needless to say, his methods were rather involved. It involved a lot of combustion analysis on an engine dyno and a lot of computer modeling. To summarize a lot of work, he found the following "effective octane number" based only on the chemical properties of ethanol. The above graph is for a 97RON base (premium fuel) mixed with ethanol, where pump E85 is going to have crappier gasoline mixed in. So these numbers are going to be a little higher than real-world fuel, but it does demonstrate that traditional octane test underrates the anti-knock properties of alcohol fuels. Those tests are actually very old. During the presentation a representative from a major oil company we've all heard of was present. He basically said (off the record) that it's too much trouble to actually change around the official octane tests. The researcher also found that, surprisingly enough, Ethanol itself has negligible charge cooling improvement over gasoline unless used in direct injection. In short: there is good reason to believe that pure ethanol doesn't actually cool your intake temps down enough to matter. That answered some of my suspisions. I have noticed on hot summer days since switching to E85, my car doesn't get as hot as it used to on gas. I have always thought the octane was rated weird. Regardless, I am totally impressed with it and it's abilty to run 30 PSI with no knock whatsoever. if you're saying that the charge cooling is the same between ethanol and gasoline is the same, but ethanol cools 30% better because you use 30% more if it, per unit air? i could see that. i used 30% just because its a number, the actual numerical values probably will be different. See now that's an interesting point. I have been digging deep into the latest big-budget research on alcohol fuels. The tests are always done at lambda=1 and they achieve very high loads. In your typical hobbyist modified engine using alcohol fuel in some way, you are looking at lambda between .70 and .80 at full load just like you find on gas setups. So in terms of sheer volume/mass of fluid entering the system, there's a lot there. On paper, there isn't nearly the need to enrich the mixture on alcohol fuels. Yet unknown to many/most/nearly all people, methanol and to a lesser extent ethanol are prone to preignition. The rich mixtures (similar to what we use on modified engines running normal E10 gas) most likely suppress this. Copper plugs are actually the preferred type for alcohol fueled engines, especially if methanol is involved. The reason for this is that platinum and irridium essentially function as a catalyst for alcohol. This was first published over 20 years ago. After a conference a couple weeks ago I've also gotten off-the-record agreement from guys who are very deep in alternative fuels research for the major OEMs. The reason why few people talk about it is because of the preignition suppression from running rich mixtures. The OEM's can't do that--customers and government regulators will not accept the higher emissions and fuel consumption. So they almost always run lambda=1 during normal operation. 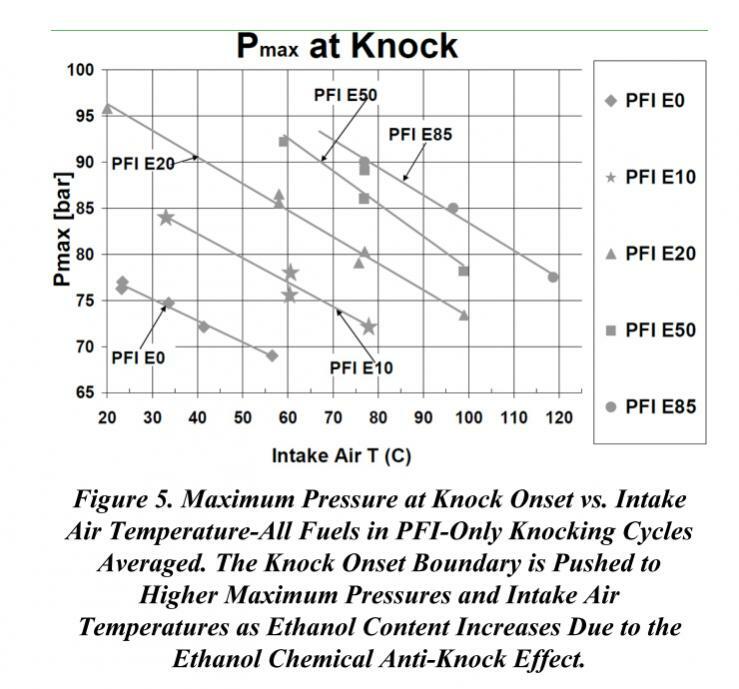 If you look through the literature, engines converted to E85 for research purposes are almost never pushing combustion pressure to the point of knock under E85 operation. Some examples of this are the GM LNF mentioned above, the Ford Ecoboost, and various uber expensive single cylinder engines used in research labs. Researchers get more concerned about the engine flying apart than knocking. The knock limit of alcohol fuels is very high if preignition can be controlled and intake temps don't get too hot. I'm not saying we should all go lean out our alcohol-fueled project car engines. It's not something you can easily play around with from street and chassis dyno tuning. Established conventional wisdom and rules-of-thumb for tuning are there for a reason. I would be very interested in this study. 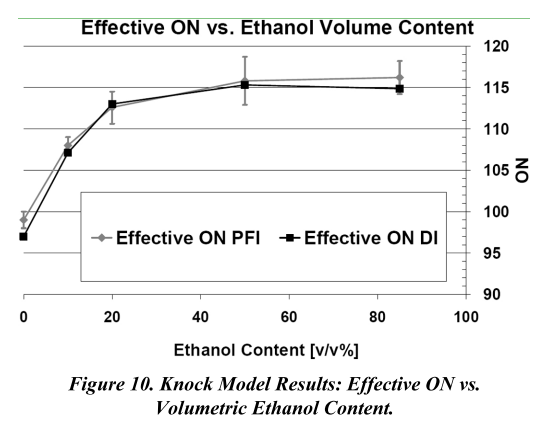 I'm not really sure if its possible to separate these two effects, for example, could 100% ethanol allow for same knock limited power as equivalent octane gasoline with same charge temperatures after injection? This is expectable in port injected piston engine as majority of fuel evaporates on intake valves and runners surfaces. It should be a bit better in rotary application. When comparing apples to apples, i.e. taking into account both difference in fuel mass and evaporative cooling, ethanol fueled engine has almost five times greater evaporative cooling effect than gasoline, methanol fueled one about nine times. And according to the study I have, cooling effect of alcohol fuels has much bigger impact than theirs chemical octane rating. Researchers get more concerned about the engine flying apart than knocking. The knock limit of alcohol fuels is very high if preignition can be controlled and intake temps don't get too hot. I leaned my car out to 12.2- 12.6 (Gas) and it responded very well. Made it a different car! Running 30 PSI now at around 12.2:1 and not even a ting of detonation. "Ethanol itself has negligible charge cooling improvement over gasoline "
no doubt i misunderstand this as i am laughing... and probably shouldn't be. the reason alcohols don't allow a simple octane measurement is because it is done at some sort of standard temp and pressure and the alcohol disallows this by cooling below the ST.
further, in my alcohol dyno runs all i have to do to assure the alcohol is working is touch my UIM after a run. if it is really really cold it is working. not knocking the above content just scratching my head. Let me start this post by saying that I will send the papers in question if you PM me. It is difficult to summarize/explain over 20 pages worth of dense, PhD level cutting-edge (published less than a month ago!) research in a single readable chunk. I am doing my best to understand the major data trends and the limitations of the study in question. There's a lot there. I spoke to the guy in person; I listened to him present for 40 minutes; I read both papers. I'm still absorbing everything and considering carefully the full context of this work. There are over 30 references cited and I certainly haven't read them all, nor do I have the time to do so. A Solstice engine in an MIT engine test cell is not an Rx-7 engine connected to a vehicle. But physics is physics to an extent, and I'd like to consider this thread discussion for discussion's sake--a provocative topic to get everyone thinking. I think we're all smart people here, but we're not PhD MIT researchers getting paid to use super expensive equipment and proprietary models from a major OEM. So maybe I'm not qualified to say whether we can make a reasonable attempt at separating the two effects. The study's methods, which I will touch on briefly, appear sound to me. I'm sure someone will improve upon them in the future though. For example, could 100% ethanol allow for same knock limited power as equivalent octane gasoline with same charge temperatures after injection? 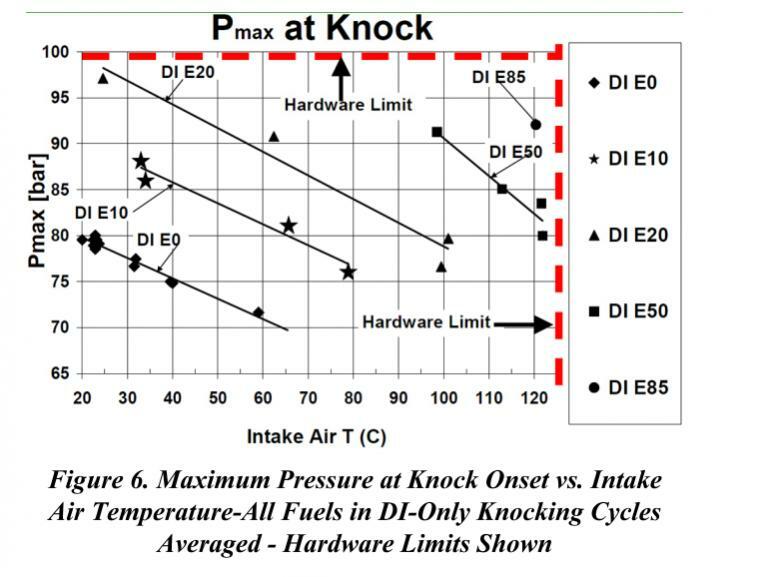 The study is based around intake air temperature and knock-limited combustion chamber pressure, not actual horsepower. Actual horsepower introduces more complicating factors because of things like friction. Any study is going to be based around some assumptions or baseline values. 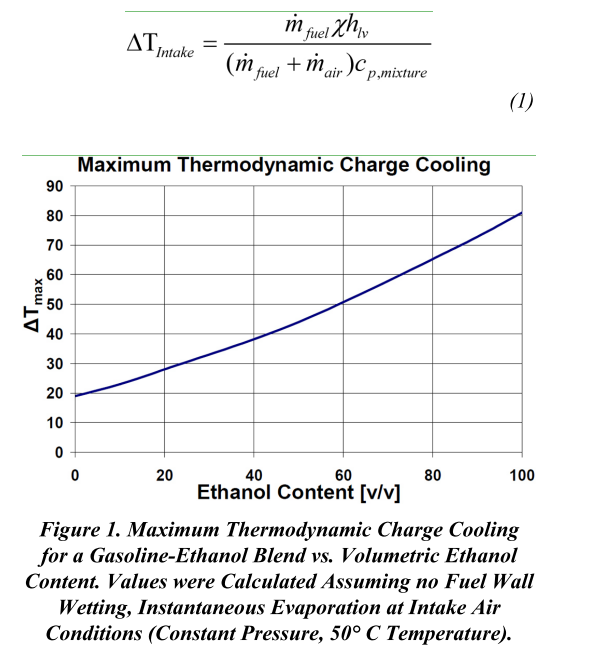 This study began by calculating a theoretical max charge cooling effect (temperature difference) if all ethanol injected instantaneously vaporized at 50C air temperature with NO WALL WETTING. according to the text: mFuel is mass of Fuel, mAir is mass of Air, X is fraction of heat absorbed from charge air (not the walls), hlv is fuel heat of vaporization, and cpmixture is average mixture heat capacity. It assumed that only 10% of the total charge cooling benefit of ethanol over gasoline is realized without direct injection due to wall wetting. This was based on the findings of 6 references that, to be blunt, I'm not going to read because they're difficult to track down. That sounds like a small number and I know a lot of people are going to be reluctant to accept it--how can we only attain 10% of ethanol's theoretical charge cooling potential when not using direct injection? If you dig into the work though, it's not so difficult a point to swallow. This is because of the drastic charge cooling differences between port and direct injection as ethanol content increases. And yes, a rotary could be different--it doesn't have valves. But we're not exactly running engine-dyno optimized injection timing and spray patterns here, so plenty of heat still could be lost from pooling when the intake port is closed. Here's what the study did in terms of experimental work. They took a GM LNF engine (Pontiac Solstice/Saturn Sky/Opel GT), which is a 2.0 liter direct injected 4 cylinder, and equipped it with an additional set of port injectors. Both sets of injectors were run on E0, E10, E20, E50, and E85. 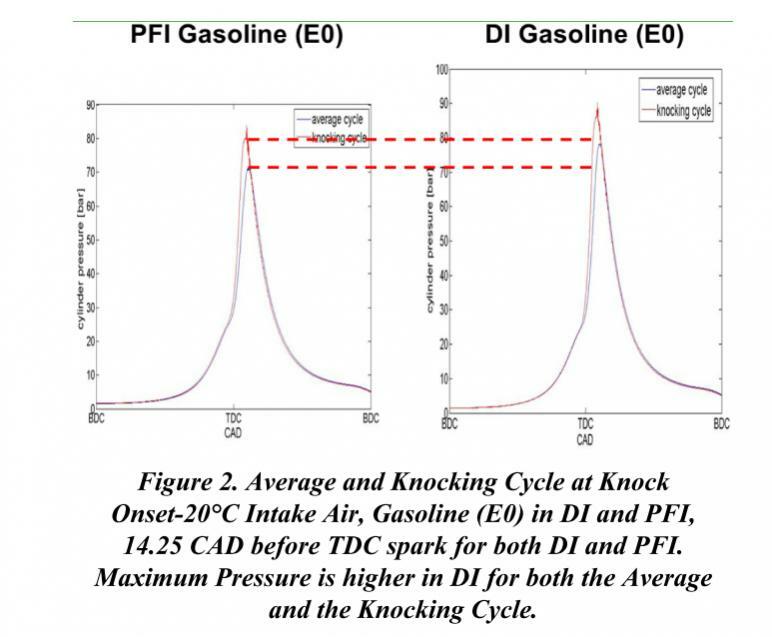 The authors found that they could "cancel out" the charge cooling benefit of E85 by heating up the intake charge with lab equipment until port injection and direct injection knocked at the same peak combustion chamber pressure. So here is the method demonstrated on E0 gasoline just as an illustration of some of the principles involved. Note that all tests are at Lambda=1 , 2000rpm (low rpm is actually more prone to knock), .35 bar boost, and fixed valve timing & injection timing. Here is the engine at the same spark timing and same intake air temp (20C). Notice how the DI configuration achieves noticeably higher combustion chamber pressure. So, what air temperature would be required for the DI engine to knock at the same combustion chamber pressure as the PFI engine? 34C actually. For purposes of the study, we could say that there is an equivalent charge cooling of 14C intake air temperature from direct injection. Now, what if we compare this temperature difference between port and direct injection but use increasing ethanol concentrations? 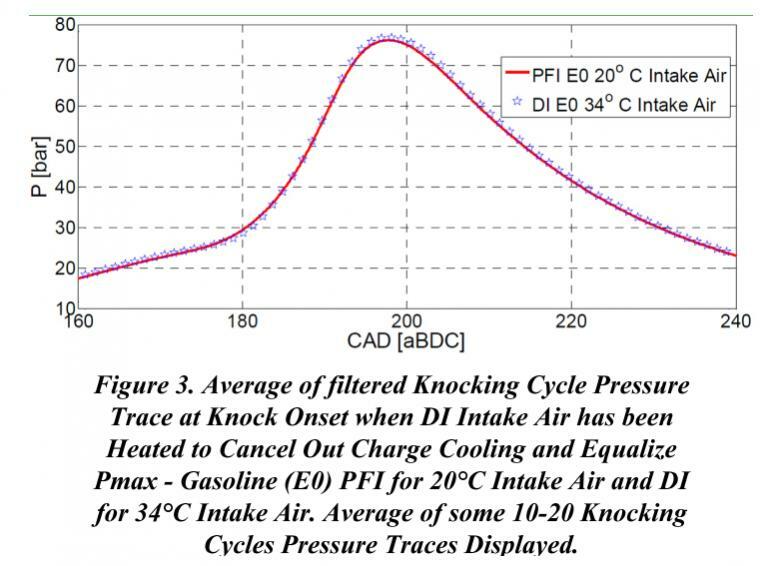 The horizontal lines relate to the charge cooling benefits of Ethanol, which are only fully realized with direct injection.. Notice how the lines get longer as Ethanol concentration increases. Right now this method is different than methods used in prior experimental studies done on this topic. As I said above, when fully optimized it should be better on a rotary but there are so many factors involved it's hard to say. For one thing, a rotary engine has a long combustion chamber and a lot of surface that could absorb the cooling effect instead of the charge air. Nobody is doing research on rotary engines now except Mazda unless you count range-extending engines for electric cars. When comparing apples to apples, i.e. taking into account both difference in fuel mass and evaporative cooling, ethanol fueled engine has almost five times greater evaporative cooling effect than gasoline, methanol fueled one about nine times. It's certainly much better for charge cooling. Clearly the more liquid you dump in, the more it's going to cool things down--giving alcohol fuels that advantage. But I am really buying this idea that wall-wetting greatly limits the untapped cooling potential of alcohol fuels. One thing that changed my mind about this is some discussion I had with a Lotus engineer about two prototype Exige S vehicles which used pre-compressor fuel injection of E0 gasoline. One used the old Rover engine with a twin-screw blower, the other used the Toyota 2ZZ engine (found in the most recent Exige S) with a roots blower. 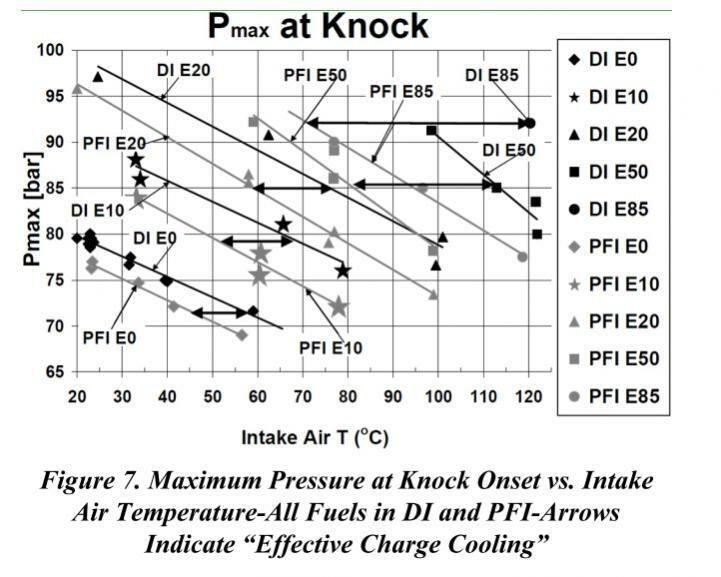 Both of these findings were published separetely (PM me about them) but basically, preturbo fuel injection does a really good job of cooling down the charge and helping out the compressor even though it's just normal gasoline. And according to the study I have, cooling effect of alcohol fuels has much bigger impact than theirs chemical octane rating. Again, when we are talking about a non direct-injection application it depends more on how much liquid you are adding in there. It IS working, I agree. And it could work even better--wall wetting with conventional systems means that alcohol fuels have a whole untapped potential that could be unlocked with direct injection technology. Coming at this from a less practical standpoint--discussion oriented: Doesn't your point about cool charge pipes just demonstrate surface cooling rather than cooling of the charge air? Remember how some old carb'd engines used to heat up the intake manifold with a coolant passage under certain conditions because so much heat was lost as the mixture traveled through the runners? It's the same idea of heat transfer from the liquid to the surfaces. -- First there was a carburetor. You also had throttlebody injection, which is still sort of like a carburetor due to fuel traveling through the manifolds. -- Then you had multipoint injection with mechanical control or crude variable-pressure constant flow systems. -- Then you had batch fired electronic fuel injection (1st gen Rx-7 had this). -- Then you had grouped electronic fuel injection--late 80s Supras had this (2 cylinders at a time, sorta like wasted spark ignition). -- Then you had sequential fire electronic fuel injection, like an FC and an FD and modern port injected engines with batch-fired tip-in fuel. -- Then you had sequential fire electronic fuel injection with individual cylinder asychronous fuel injection during tip-in. -- Then you had earlier forms of direct injection--swirl injectors for example. -- Now you have highly optimized forms of direct injection with multi-hole injectors and careful spray targeting, and on the most expensive systems you have spray guided piezoelectric injectors so that very little fuel touches the cylinder walls and the piston. A lot of all this has to do with emissions, and I know I'm rambling a bit, but the point is that wall-wetting is a big deal. Lots of development has been done to minimize it. Remember how some old carb'd engines used to heat up the intake manifold with a coolant passage under certain conditions because so much heat was lost as the mixture traveled through the runners? It's the same idea of heat transfer from the liquid to the surfaces. building a carb'd P port was interesting in a lot of ways, but particularly that. with the P port the intake is actually really close to the exhaust, so if you warm it up to temp and just let it idle, the part of the intake by the engine is HOT, but if you put your hand by the base of the carb its actually cold, not cool, but cold. it's strange, EFI cars will usually have an intake that is cool to the touch when its running, but the carb is much colder. That is probably due to far better fuel atomization using fuel injection therefore reducing wall wetting.